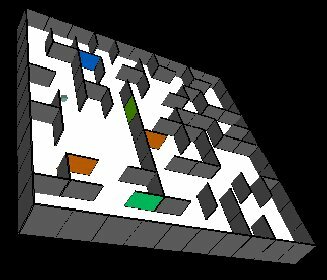 MiMaze3D is the VRML extension of MiMaze, a totally distributed game on the Internet, using multicast communication between players. MiMaze3D uses the External Authoring interface to allow the external Mimaze application to access nodes in the VRML maze. Click here to see a global MiMaze-MiMaze3D screen shot ! VRML scene. All these operations are done from a Java applet (see below) embedded in the same HTML page. 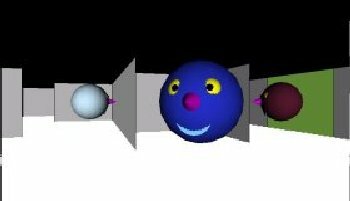 the UDP connection takes care of avatar motion. been optimized to minimize the delay before the display of the 3D graphics. Therefore we have designed a specific scheduling algorithm to maximize the realtimeliness of the application. dynamically switch from one view to the other. Mpeg-1 scenes are transmitted locally (and not through the network).